With 3 of Rockets Academy youngsters away on other Club duties, it was up to the chosen 9 to try and take the scalp of the fast and sharp shooting Crusaders who came to Reading on the back of a double header winning weekend compared to Rockets double loss weekend. Rockets were first on the scoreboard as Sydney Donaldson hit a treble but that was his only contribution as he was called for a pair of quick fouls very early so rested till almost half time by which time he had added another personal foul putting more pressure on the three 16-18 year old Academy students who rose to the occasion. Rockets twin spearhead of captain Danny Carter and A J Carr further imposed themselves in the key and helped themselves to 13 points as Rockets took the first period 20-14. Crusaders began the second quarter with an 8-2 run but 18 yo Adria Nosa scored with a floater and converted one from two from the free throw line before Carr excelled himself in the quarter with a slam immediately followed by a block. Carter scored inside and sent a dish pass to Trae Pemberton to hit his first treble of the evening moments before Adrian O’Sullivan drove to lay-up and also sent a dish to Pemberton to score another treble. Superb team play saw Pemberton finishing with a lay-up and Carr stealing the ball and giving a length of the court pass to his captain Carter as Rockets saw themselves 11 points up with just 1.24 before the interval. A Crusaders time out proved positive for them as Rockets lead at the break was reduced to just 42-36. A brace of trebles from Crusaders at the start of quarter three fired up the Rockets and their big guys dominated the key as they scored twenty of the hosts twenty nine points in this period with Pemberton commanding the defensive boards. This quarter was a delight to watch for Rockets fervent supporters as Rockets made nine assists and five steals to disrupt Crusaders and ease to a 71-56 advantage for the start of the final period. Crusaders scored from their first possession but Arinze Emeka-Anyakwo gave an exquisite dish to his younger ( 16 yo ) Academy player David Chive who stroked a treble moments before Carr went base line for a slam and Chive scored with a hook shot to give Rockets a 78-58 lead but again Crusaders went on a 8-0 run before Chive hit another treble and Carter sent a quality bounce pass to Donaldson to score. Carter and Carr were again primary influencers in the box and 30 yo Carter decided he wanted to help himself to a slam as the game was beyond the Crusaders who never surrendered momentum or heart but Rockets took league win number five with a twenty point victory at 94-74 . 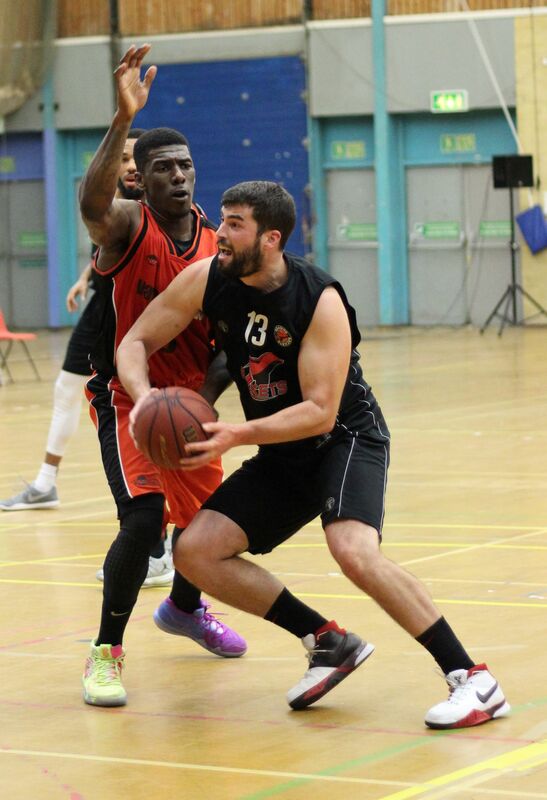 Top scorers for Rockets were Danny Carter with his most impressive game of the season to date as he hit 26 pts. took down 6 rebounds, and made 5 assists and 3 steals. A J Carr , in front of his family visiting from the USA, hit 23 pts., took down 8 rebounds, made 5 assists and also 3 steals. 16 yo David Chive hit 13 pts., and Trae Pemberton had a double double with 10 p[ts., and 1o0 rebounds . Rockets now head to the Midlands next weekend to take on the Hoods as both teams vie for the fourth league spot.